Our truck mounted carpet and upholstery cleaning equipment is very high powered and removes all of the soiling, harmful residues and allergens right out of your living environment and into our sealed waste tank. For many materials, like some upholstery and drapery fabrics, we use portable and specialized equipment so that we may tailor the tools and products specific to the sensitivity of what we are cleaning. 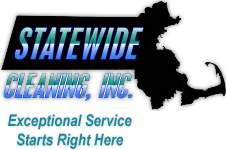 Statewide Cleaning is Green Seal Certified and stocks a variety of light and heavy duty professional cleaning agents to correct the many types of services we offer. For our environmentally conscious clients, we also stock certified Green Cleaning agents and even soap-free products for exceptional rinsing capability. We carry deodorant-free products as well as sanitizing agents for our customers with sensitivities to synthetic perfumes and cleaning agents. When carpet and upholstery materials need to be protected after cleaning, we are also equipped with the EPA’s certified green protective coating, GREEN GUARD. This product will assist with dry soil removal and stain resistance long after the job is done.